With a large ingredient and cup capacity the Genesis has been designed to provide delicious, thirst quenching hot drinks around the clock. 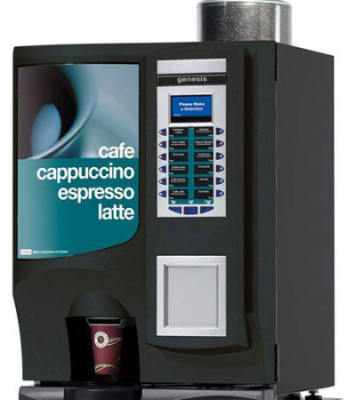 The machines offer a full range of instant, fresh brew and ‘bean to cup’ (B2C) drinks and provide the perfect solution for offices, restaurants, cafeterias and conference facilities. Genesis machines are also environmentally friendly! The latest energy saving software significantly reduces energy consumption whilst keeping the machine â€œvend readyâ€. A bean to cup Genesis in energy save mode now uses 28% less energy per hour than when in idle mode while instant/fresh brew models use 35% less energy per hour!